"This is the end of the French exception. Gemey Maybelline officially becomes Maybelline New York. That was in the trade press some time ago. This is the life of brands, but let us not forget their origins. Let us take this opportunity to briefly review the history of these two brands and especially their main products. The Maybelline Company was born in 1915 in the city that never sleeps in the United States, New York, thanks to a chemist named Tom Lyle Williams. It is reported that this step would be consecutive to an unfortunate event: it is in 1914 that a drama arrives in the kitchen of Miss Mabel Williams, her younger sister. Indeed, the young woman would have suffered the loss of her eyelashes and eyebrows following a fire and, to cheat on the loss of these precious hairs, created a product based on charcoal ash as well as"petroleum jelly", petroleum jelly for insiders, to apply it on the areas now free of beards. Something she apparently found in the magazine Photoplay ( Photoplay is one of the first magazines for moviegoers. It was founded in 1911 in Chicago, the same year as the magazine Motion Picture Story . He disappeared in 1980). Thomas Lyl Williams, who has just started a mail order company, finds the idea innovative and decides to found the company"Maybell Laboratories" to market it. But this product has the disadvantage of stinging the eyes. Thomas Lyl Williams then turned to a specialized laboratory, Parke-Davis, a wholesale drug manufacturer, to make a product suitable for sale. The result was a scented cream composed of refined white vaseline and several oils. This first product is called Lash-Brow-Ine made from petroleum jelly, a"modern" substance for the time, and coal dust, now known as carbon black or"Carbon black." With his first income, he advertises in Photoplay to develop his business. In 1917, still with the collaboration of Parke-Davis, he created a cake mascara. The exact composition of this product remains unknown, but it was probably a sodium stearate mascara, also known as'water mascara' or'mascaro'. The products on which the cosmetics industry will build empires were born. The brand name came to Thomas Lyl Williams by association from that of his sister, Mabel, then became Maybelline in 1923. After mail order sales, the brand turned to in-store marketing. An approach that will provide it with good means of development to pursue its growth. And so it was in 1971, Great Lash The first water-based cream mascara, the first, was born in its famous pink and green case. The brand will actively continue its development by creating new products that have made progress in different categories. The L'Oréal group acquired it in 1996. The American company Gemey was founded in 1923. It appears for the first time in France with a classic compact foundation for the time, called" pancake "By analogy to the shape of the product which resembled the cake of the same name. These products were born from the development of cinema and particularly technicolor which posed specific make-up problems. It was mainly make-up characterized by a strong covering power and a rather strong thickness. Often based on fat mixtures to which was added a fairly high proportion of powders (grease-paint), all poured into wells. Another technology consisted in a cream loaded in powder then dehydrated and presented in cups (pan). These products were very popular. The brand was then present on different markets such as foundations, powders and facial care. In the 1930s, a period when women wanted to be natural and spontaneous, Gemey launched a powder in eight shades, very fine for the time, for a guaranteed discretion. It was also during this period that women began to coordinate the color of their lips with that of their nails; to satisfy them, Gemey expanded its make-up offer with the appearance of the first Red and Coordinated Varnishes (1937). The brand's make-up expertise is complemented by proposals in the skincare, haircare and suncare markets. In 1954, Gemey invented a product that became cult in the cosmetics industry: the first fluid foundation in a tube, Fluid Make Up . It was a fluid emulsion, pigmented, allowing a much simpler and faster use. The make-up result was less covering but the application of the product was more pleasant because it gave a feeling of freshness when used. This product will become a great standard of make-up. The make-up product ranges were then completed with the first compact powder. , Last Key launched in 1956. In 1973, Gemey was acquired by the L'Oréal group, and in 1976, the Ricils mascara brand, also acquired by L'Oréal, was added to expand its offer in all make-up segments. In the 1980s, the signature Gemey Paris is developed by the merger of the Gemey and Ricils brands. Back in the'80s, Gemey launches the Extreme Eyelash The famous vitamin mascara (d-Panthenol): a real bestseller. This product will become one of the standards of volumizing mascaras. The brand is then established on all make-up circuits. 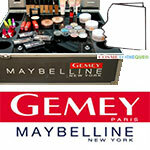 In 1998, Gemey Paris and Maybelline New York joined forces in France to form a single brand: Gemey Maybelline. Internationally, Gemey Paris disappeared for Maybelline New York. L'Oréal decided to merge the two companies in 2000. The products will now bear the names of both brands. Among the numerous launches, a new bestseller will be born under the signature Gemey Maybelline, Dream Matte Mousse . It is a foundation that takes the codes of the Pan cake, the bucket being replaced by a glass jar. A very original formula, anhydrous, based on silicones and elastomers allowing an easy and fast make-up, matte, long lasting and water resistant. It will be the leading product of a new generation of foundation. List of ingredients in 2006 Cyclopentasiloxane, Dimethicone, Squalane, Dimethicone crosspolymer, Dimethicone/Vinyl dimethicone crosspolymer, Hydrogenated jojoba oil, Polymethylsilsesquioxane, Polymethyl methacrylate, Silica dimethyl silylate, Phenoxyethanol, Phenyl trimethicone, Disodium stearoyl glutamate, Methylparaben, Vinyl dimethicone/methicone silsesquioxane crosspolymer, Aluminium hydroxide, Silica, BHT, Ethylparaben, Butylparaben, Isobutylparaben, Propylparaben (+/- Titanium dioxide, Iron oxides, Bismuth oxychloride, Mica). At the end of 2016, the group decided to rename all the Maybelline New York ranges, destined for the brand Gemey to get into the history books! But these two brands have thus strongly contributed to the definition and development of several cult products in the cosmetics industry.